The Peninsula School of Art (PenArt) invites all ages to participate in its first annual Winter Print event: a family-friendly, hands-on art-making event held during Fish Creek’s Winter Festival. Head to the school in Fish Creek on Feb. 2, from 10 am to 2 pm. 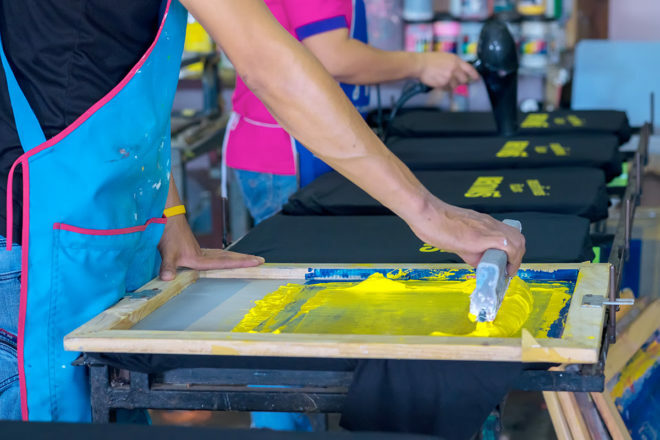 Participants can choose to do one – or all three – of the activities: screen-print a commemorative T-shirt, block-print a tote bag or hand-color a limited-edition poster. Working with local artists, the school created two commemorative designs that will be printed on posters. These posters can be hand-colored, creating a signature piece of art. Participants can also screen-print the designs onto a T-shirt. Of course there will still be food. PenArt has partnered with Peninsula Preschool, which will serve mac ‘n’ cheese, brats, sides and beverages in the Guenzel Gallery. There is no advance registration. The costs are $5 per lunch, $10 per T-shirt, $5 per tote plus poster, and $2 per poster. All proceeds will benefit the educational programs of the nonprofit Peninsula School of Art and the nonprofit Peninsula Preschool.